Astor Kensington kohteessa Lontoo, Englanti: Varaa nyt! Note: 18-40 yrs old only. 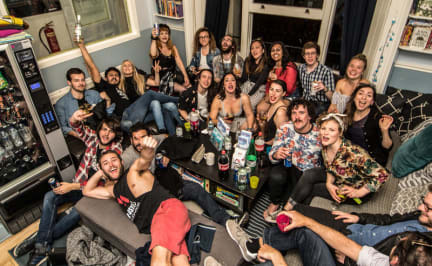 Astor Kensington won 1st Best Small hostel chain and 1st in the Lifetime achievement awards at the 2015 Hoscars! Astor Kensington is in the upscale neighbourhood of Bayswater, beside Oxford Street, Hyde Park and Portobello market. Hostelworld guests say they appreciate that the hostel is 'within walking distance of the Queensway and Bayswater tube stations'. Our reviewers appreciate that the staff are 'really helpful and polite. They seem to have their own little family with each other, making it feel really welcoming and open to guests', said one of our visitors. 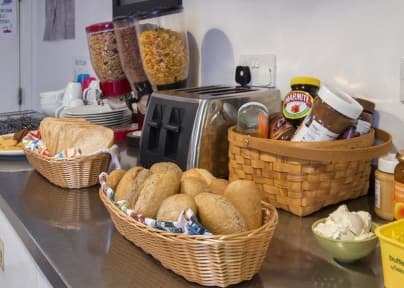 We like that this hostel has an 'excellent', 'well-equipped kitchen' and 'the best breakfast for hostels for this price range in London'. Located a short walk from Notting Hill, Hyde Park and Kensington Palace (home of William, Kate and the Royal Babies!) it is easy to see why so many people fall in love with this neighbourhood. With three Underground Lines and countless 24hr buses, Astor Kensington is the perfect hub from which to explore London. A short walk around the neighbourhood will take you through the world famous Portobello Market, Kensington Gardens and London’s most expensive street! Hop on the tube or bus and within 10 minutes you’ll be in the heart of Oxford Street, Piccadilly Circus and Leicester Square! • Free Fast Wi-Fi throughout the building as well as Free PC Access. Everything else was really fine (toilets etc were clean, nice beds, friendly staff), but the only minus was that there wasn't a reading lamp in the bed. It is a bit hard to read with your phone light, if someone is trying to sleep and the only light in the room is turned off. Astor Kensington won 1st Best Small hostel chain and 1st in the Lifetime achievement awards at the 2015 Hoscars! ., .